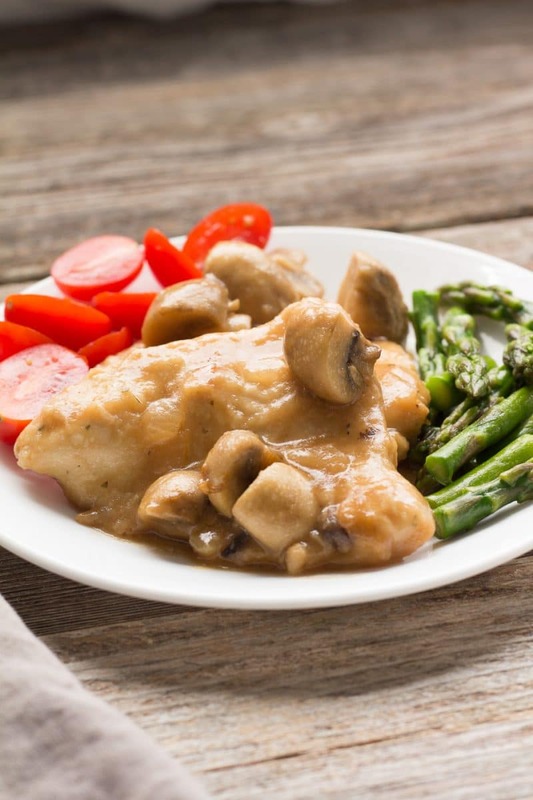 Chicken Marsala is an easy chicken recipe that can be whipped up on a weeknight. 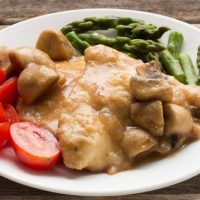 This version of Chicken Marsala is a great way to change up the monotony of chicken in my house. I cook a ton of chicken. Well, maybe not a ton since that would be 2,000 pounds. Chicken with rice, chicken on salad, chicken in soup, chicken parm, grilled chicken wings, baked chicken wings…..
Disclaimer: I do not claim that this recipe is authentic, or tastes identical to anything you get in a restaurant. This is simply the way I make it at my house and the way we like it at my house. I like to cook this recipe because it is fairly simple and is something I can start and simmer until it’s time to eat. The slower the simmer, the longer it can sit. It’s easily served with angel hair mixed with a little olive oil and garlic, orzo and asparagus, or even wild rice. My preferred Marsala wine is a sweet version. Marsala wine can be difficult to locate, and sometimes a liquor store employee might look at you like you have 3 heads. They may even have it hidden with their dessert wines. If you can’t find it, you can substitute some sherry wine or even some red wine, but I opt not to make Chicken Marsala if I cannot find it. I prefer sweet Marsala wine because it gives just the right amount of sweetness to the background. Using red wine is going to make this more akin to Coq au Vin than Marsala. When the recipe says to brown your chicken, this is about all the brown it needs to be. It does not have to be cooked completely, and actually better if it is not cooked through, as it will simmer in the broth and Marsala wine mixture. The sauce will be very thin when you add the chicken to the pot. It will reduce and thicken as it simmers. The color of the sauce will become darker, as will the coating on the chicken. This is exactly what you are trying to achieve. When your chicken gets to this point, turn the heat to the lowest setting available and prepare your side dishes. Just before serving, remove the chicken to a serving plate, leaving the sauce in the pan. Remove the pan from the heat and add a tablespoon of cold butter and stir it into the warm sauce for a real treat. Do not cook the butter, simply stir it in just until melted. Monter au beurre is the technical name for thickening and finishing warm sauces with butter. Pour the sauce over the chicken on the serving plate. 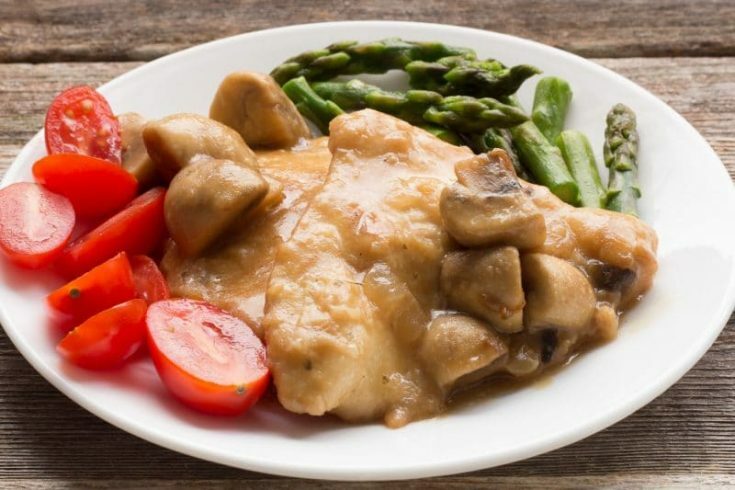 Sauteed chicken with mushrooms and a Sweet Marsala wine sauce. Mix flour, garlic, pepper and oregano in a bowl or on a plate. 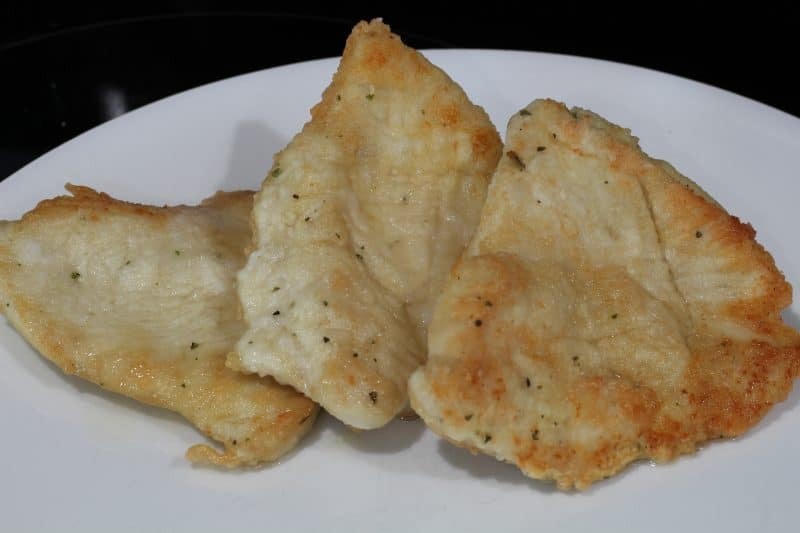 Dredge both sides of chicken pieces with flour. Set aside while you get the pan ready for frying. Coat a large non-stick skillet with olive oil and heat over medium-high heat. Carefully place coated chicken in hot skillet and fry until light brown. Turn the chicken over and fry the other side until light brown. Move to a plate. You may need to fry in more than one batch. 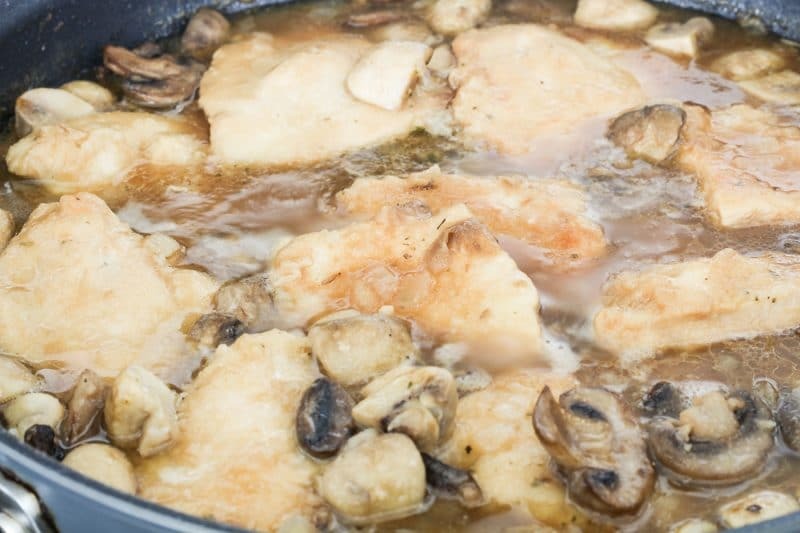 One all the chicken is fried, place the mushrooms and chopped onions in the same pan and cook until slightly softened. Add chicken broth and Marsala wine, bring to a boil. Boil for a minute, reduce heat to a simmer, add chicken back into the pan. Turn chicken to coat with liquid. Simmer, turning chicken occasionally until chicken is done and liquid is reduced. 20 to 30 minutes. Remove chicken, add cold butter to sauce in pan and mix in quickly. Turn off heat and pour over chicken. Use Marsala wine from a liquor store if available, the cooking version from a grocery store just does not taste the same. Dry Marsala can be used, but I prefer the sweetness from the sweet Marsala. If it is too sweet for your tastes, you can add 1/2 teaspoon white wine vinegar or lemon juice to add acidity. Dry Marsala can also be substituted.